The price of cocaine has fallen dramatically in recent years, but so too has the quality. Users could increasingly find they are ingesting a number of other chemicals added to bulk it out, including a banned painkiller which could cause cancer. In a quiet laboratory in central London, plastic polybags containing seized powder are handed to a scientist. Karbinder - known to his workmates as "K" - is testing to see if the substance inside the wraps is cocaine, and if so, how pure it is. Many of the one-gram wraps are folded into cut-up lottery tickets, as has become a bizarre custom among dealers. K takes a small amount from each wrap, puts it into an individual plastic tester and loads it into a mass spectrum analyser. This will confirm that the substance is cocaine; further tests will establish how pure it is and what other chemicals might be in the mix. At its laboratories in Lambeth, the Forensic Science Service tests much of the cocaine seized by officers from the Serious Organised Crime Agency (SOCA) and the police. In recent years, the testing has shown up an interesting trend. Cocaine has moved downmarket. More and more people - especially teenagers and students - are buying cocaine and they want it cheap. Prices as low as £25 for a wrap are not uncommon - and at this bargain basement price, what the buyer often gets is a bargain basement product. "Five years ago, most of the street cocaine we seized had a purity of around 50%," explains Rob Wainwright, international director of SOCA. "But we're now finding a lot that is of far lower quality - some barely 10% pure. The danger is that drug dealers are cutting cocaine with other, often quite dangerous, chemicals to make it go further." Much of the seized cocaine is found to have been cut with phenacetin - a pharmaceutical drug banned some years ago in Britain and most other nations for causing kidney failure and cancer. 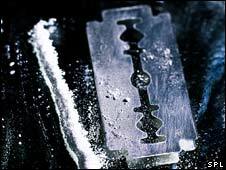 Other drugs used for cutting or "bashing" cocaine include lignocaine (a dental painkiller), tetramisole (used for de-worming pets) and boric acid (used to kill cockroaches). Dr Alun Morinan, from the National Addiction Centre & Hope UK, a Christian drug education charity, says that young people using cocaine will not realise what they are taking. "Cocaine is bad for you anyway - it can cause heart problems among other things - but the phenacetin is a drug that was banned here many years ago because it was found to be linked to kidney failure and renal cancer. "And of course, the kidneys are the part of the body that filters out any impurities in our bodies, so for a drug user impaired kidney function is especially serious." Back in the laboratory, the testing continues using highly expensive and sophisticated equipment. Dean Ames, lead drug scientist at the Forensic Science Service, says that it's impossible to tell the purity of the drugs using the naked eye. "The cocaine is a white powder and the drugs it's being mixed with are also white powder. "It's impossible for someone buying a wrap of cocaine on the street to tell, just from looking at it, what it's been cut with."